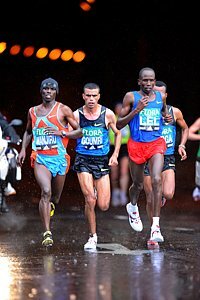 The 2008 London Marathon lived up to it's hype as the greatest marathon in the World. Martin Lel led they way once again as he got his 3rd London win, his third straight World Marathon Major win, and a course record 2:05:15 as three men went sub 2:06 for the first time in the same race. What a race it was as three men were together entering the final mile. In the final mile, Lel first dispatched of last year's London and NY runner-up Moroccan Abderrahim Goumri (2:05:30) before waiting to the 26 mile mark to almost nonchalantly destroy 21 year-old phenom, world half-marathon record holder Sammy Wanjiru (2:05:24) with a 57 second clocking over the final 385 yards (65 400 pace). 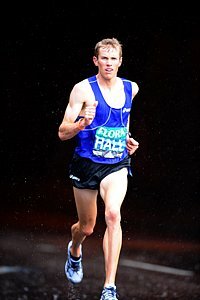 American Ryan Hall was with the leaders on world record pace (1:02:13) at the half way point. After falling off the pace a little after 25k, Hall caught back up rejoined the leaders on the 21st mile before being dropped again. He held on to run 2:06:17, the 3rd fastest time ever by an American, to finish 6th and earn a $50,000 bonus (prior to Sunday 7 men in the history of the world had run under 2:06:15, now 11 have) for his 2:06:17 clocking. (For more on Hall's race, please lick here). The race started in near perfect running conditions. Cool and sunny, not too windy. The pace was very brisk from the gun. So fast that by 5k there were only 9 runners and the 2 pacers in the lead group. The 5k was reached in 14:21 which is 2:01 marathon pace. Granted the 3rd mile (4:25) is downhill, but the pace seemed suicidal. (For an excellent analysis of the race's pace see our friends at the Science of Sport Blog). Things settled into a more reasonable pace by 10k (29:10, 14:49 for that 5k) but they still were on world record schedule. 10 to 15k (44:00, 14:50) was run at virtually the same pace. Then things lagged just a little through 20k 58:58 (14:58). Nonetheless, the same lead pack reached halfway on world record pace - in 1:02:13. The pace then would begin to exact its toll. The first to break was 2005 London Champ Felix Limo. By 25k (1:13:47, 14:49), Hendrick Ramaala was hanging on for dear life and would be next to fall off. Before the 25k mark, Ryan Hall had gone to the front and told the rabbits to keep the pace consistent as he noticed Ramaala was hurting. Hall afterwards said the 15th mile was slower (4:55) and he wanted an honest pace. The rabbits accelerated a lot and soon Ryan was off the back himself (around 1 hour 20 minutes into the race). Afterward Ryan regretted his impatience, "I made a classic rookie mistake. I felt the pace slowing down (4:55). I noticed some of the guys were struggling in our group ... and I wanted to test them out to keep it honest to see where we're at... Then they totally took it out and gapped me." Hall however did not completely fall off the wagon. He basically maintained the pace he was going while the others picked it up (14:51 for Ryan's 6th 4k, 14:42 for the leaders, Hall said he ran 4:47 on the 16th mile while the leaders went sub 4:40) as they hit 30k in 1:28:29, and the lead pack was down to 6 as the rabbits were no longer in the race. By 35k the pace slowed tremendously, 1:43:54 (15:25) as the weather turned for the worse (at some point around here it started raining hard with a noticeable temperature drop) and the lead pack began to prepare itself for the push for the finish. This enabled Ryan Hall to briefly rejoin the lead pack. It was to be short-lived as soon the pace picked back up (14:59 for 35k to 40k) and we were down to three, reigning London and NY Champ, Lel, the young upstart and world half-marathon record, Wanjiru, and the eternal bridesmaid Goumri. Goumri did his best to try and drop Lel and Wanjiru but he was unsuccessful. Twice last year Goumri had finished behind Lel in sprint finishes at the end of major marathons and thus Goumri likely knew he needed to crack Lel before the finish.. But he was unable to do so. But while Lel likely had Goumri's number over the final sprint, the question was would Lel be able to deal with the speed of the half-marathon record holder Wanjiru? Yes. All three were together until the final two minutes of the race and then Lel accelerated and it was over. He poured it on the final straight to get the win in 2:05:15 as he was followed by Wanjiru (2:05:25) and Goumri (2:05:30). The fading Emmanuel Mutai would just hold off Ryan Hall for 5th (2:06:15 to 2:06:17) as Hall passed Deriba Merga over the final 2k (2:06:38). Despite the rain and wind over the final miles this was clearly the fastest marathon in the history of the sport. Never before had three broken 2:06 in the same race, this year three were at 2:05:30. Six were under 2:07 and that had never been done before. The first six all set prs and all picked up $50,000 bonuses for sub 2:07s. The day certainly belonged to Lel whose win furthered his claim as the top marathoner in the world, and likely locked up the second World Marathon Majors title and it's $500,000 prize in addition to the $105,000 that he officially won on Sunday (with appearance fees and bonuses he won more than double that for sure). Lel was full of praise for Wanjiru and Goumri afterwards. He said, "It was my first time to be with my friend, Wanjiru (in a marathon), and Goumri is my great friend (and a tough competitor), so I know I had to use my experience (to win), because I know if I am realistic I could lose." Lel appeared to try and push the pace on the Embankment before the finish but Wanjiru stayed with him. Once again Lel relied on his patented marathon sprinting abilities to get the win. Lel commented, "I knew I needed to be ready to sprint. He (Wanjiru) didn't appear to be hurting... It brings me much pleasure to be with him (in a race and come out on top).. to be a champion you have to meet more challenges." This time around Lel did some of his training in Namibia with Boston champ Robert Cheruiyot. Lel said his training was not perfect but that Cheruiyot gave him confidence. Lel said, "I really felt like the training was not good...but Robert was confident in me... (He said) "'Don't worry about Lel he will win the race.'" All that is missing on Lel's resume is an Olympic or World Championship medal and that turns his attention to Beijing where he likely will be on the Olympic team with Wanjiru and possibly Cheruiyot. Lel said he is not worried about running in the heat as it affects everyone. He said, "Whenever they say there is a problem with heat or rain, I realize... all of us face the problem. The conditions can not keep me from doing well in the Olympics." The Kenyan men have an abysmal record in the Olympic marathon (3 medals ever, no golds), but Lel feels this would be a great year for a Kenyan breakthrough at the Olympics. He said, "This is our chance this year for Kenya to win a medal... We have strong marathoner runners, recognized throughout the world and what are we missing? A (gold) medal. It is not logical, but this time I tell my friends. Sammy Wanjiru and Robert (Cheruiyot)... let us try and grab a medal." If Martin Lel makes it near the finish-line in Beijing in the lead pack, you might want to go ahead and start polishing that gold medal to put around his neck. We have Ryan Hall's own reaction, his coaches and dad and granddad's reaction to the race in this separate article and a video interview below, but here is what Martin Lel had to say of Ryan. Lel said, "The guy is very strong for sure. I was just running.. and all of a sudden he came to the front and he talked with the pace maker, 'The Pace is too slow try to push.' So I said to myself, 'Am I not running (fast enough) or what?' because we were going the right speed and the guy (Hall) was comfortable. I asked myself many questions and (realized) "Now I need to be prepared (for whatever happens the rest of the race)...That is why (later when Ryan fell off) I looked back to see if my friend (Ryan) was still there (close to us)."